Samuel L. Jackson speaks like a building storm; his words have lightning jags in them. When he taunts his quarry, which he does with great frequency in the moderately enjoyable retro thriller “Shaft,” his throat tightens, throttling syllables. His voice kicks up a few octaves until words sing with angry strain. Expletives fly in shrapnel sprays. “What’s my name? What’s . . . my . . . name?” shouts Jackson at a preening dope dealer as his pistol forges an elaborate imprint on the pusher’s cheek. The answer is simple: Shaft. But, you know, it’s hard to talk when your teeth have just been knocked out. In his crime-dude roles, in films like “Pulp Fiction” and “The Negotiator,” Jackson is pure gale-force attitude and wrath-of-God fury. He’s no less here, if slightly tempered by the velvet savoir faire that runs in the Shaft genes. It would be helpful to clarify here. 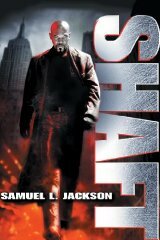 Jackson does not play Shaft — the Shaft, John Shaft, the buff, unruffled private detective Richard Roundtree created in Gordon Parks’ 1971 blaxploitation hit “Shaft.” His name may be John Shaft in this vivid homage to the original, but he’s merely the nephew of Roundtree’s Shaft. Got that? Roundtree, thick and hale and still, 29 years later, sporting a resplendent turtleneck, pops up two or three times here as . . . Uncle John. About now, you can consider the word “shaft” as a verb. Get over the risible uncle-nephew contrivance and you might glean reasonable fun watching this contemporized rendition of an old funk song. That too — Isaac Hayes’ Oscar- and Grammy-winning theme tune, a sequins-spangled call-and-response groove — is back with new polish. Director John Singleton, whose work has disheartened since his keen debut “Boyz N the Hood,” keeps “Shaft” popping on a fizzy retro vibe, but he isn’t overly impressed by or worried about the iconic template he’s retooling. This is good, because it saves us from another bout of glib ’70s genuflection, which long ago made our back and knees ache. Even Roundtree’s poofy Afro tuft has been shrink-fitted to his skull. “Shaft’s” pace is brisk, after a poky start, and Singleton loads almost every scene with a hard jolt of concussive violence. It’s a more-than-competent urban action flick, with plenty of quickening laughs. A funky wah-wah shuffle and bleating horns propel the spurts of guns and cars and thrashing fists. Indeed, the entire soundtrack, by Hayes and David Arnold, bracingly complements the fast and funny action.